* Favorite Moment: Staying up late last Friday night and laughing with my girlfriends till my sides ached. * Best Surprise: The little goodie basket one of my women's retreat roomies made for each of us. I love presents! * What's Making Me Happiest: Another photography class and girlfriend day tomorrow. * A small change with big dividends: Get up early! A few weeks ago I made Sloane cry. We were running late and I took it out on her. She forgave me immediately, but I felt terrible. I determined never to do that to her again. I made a promise to get up earlier every morning. I've kept that promise for two weeks now and my whole life is going smoother. Really. One of my favorite things to do is go to art museums. I really en;joy photographing paintings and sculpture that I love. Sometimes I can't resist playing with them a little bit in post-processing. 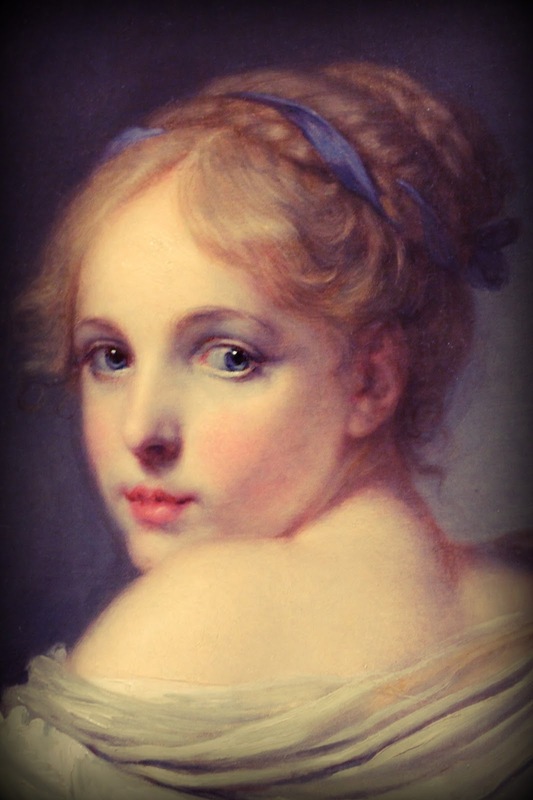 This image is a slightly edited version of Head of Girl by Jean-Baptiste Greuze. I do dreams of laughing like that one day. I don't think my friends know how to laugh. I would love traveling with Kiki and Coco to Paris. That sunflower was just pure fun with the photography changes. A lovely list to start off the weekend Relyn-thank you! I like that quote about normal-such a pointless concept normality-everyone is their own normal I think. I have been trying to get up earlier too-I think it gets slightly easier as January moves into February-less dark anyway! Have a great weekend! Always enjoy these links. Some of those wrapped gifts are enchanting. This is great Relyn. I liked the image of the week and loved your Mamaw quotes! What's that got to do with the price of tea in China? Sweet memories. Relyn, I'm so glad you like the sunflower! Thanks for including me in your favorites this week. I created the image from a photograph I took last summer. I used the percolator app on my phone to create the circles. Of course you felt terrible for getting frustrated, but admitting that you were wrong and then doing something about it makes such a difference. Sloane knows you love her. And good for you for getting up a little earlier. I've heard that it's a great way to start the day. I love your honesty. It can be tough when we have a moment that we wish we could just swallow and forget. The good thing is that you have a daughter that loves you just the way you are. I can just hear the joy in your words. Your blog is a sunny place to be. I so enjoy your Friday Faves, Relyn! Thank you for sharing, and I hope you have a wonderful weekend! Great quote-- It made me smile. Hope your weekend is GREAT. Sounds like your days are filled with delights and enjoyment, Relyn. Wishing you a week ahead filled with lots more! want to see it w/me?!! I read your post "Hide and Watch" and was tickled at your Mamaw's quotes. Some are new to me. I'll have to remember to say "I'm not old. I've just been here a long time." Love witty quotes. Thanks for sharing. I love your lists and having been a slow visitor to all while sick, I'm so glad to see this one to make me smile!